Shakti Women’s Aid is a voluntary organisation which provides temporary refuge accommodation and support to all black minority ethnic women, their children and young people experiencing and or fleeing domestic abuse/forced marriage/honour based violence from their husbands, partners/ex-partners and other family members within a household. The word ‘Shakti’ is derived from Sanskrit meaning ‘strength’, particularly feminine strength and empowerment. Shakti Women’s Aid came into being in September 1985, when a small group of black women applied for funding, with the help and support of Edinburgh & Lothians Women’s Aid, to the (then) Edinburgh District Council, for funding to set up a separate refuge for BME women and their children fleeing from domestic abuse. In April 1986 the Edinburgh District Council Housing Department approved funding for office premises and two part-time workers, and by September 1986, the workers were in post. Shakti’s definition of Domestic Abuse is wider than most, it not only recognises perpetrators as a partner or ex-partner, but also other family member such as in-laws. Prior to the birth of Shakti BME women and their children were using the main stream women’s services, where some of them faced racism and discrimination. In addition, women found that the service provided to them was inappropriate and or did not meet their emotional, cultural, religious and practical support needs. It was recognised early on that a Specialist Refuge Accommodation was needed to allow BME women to overcome additional barriers such as communication, religious and dietary practices racial discrimination, which is unfortunately still a reality for many BME women living in Scotland, individual’s facing racism from people on the street to structural racism such as immigration laws, and other discriminatory practices which exist within mainstream service provision. In June 1987, the first refuge (Shakti) for BME women in Edinburgh was opened. 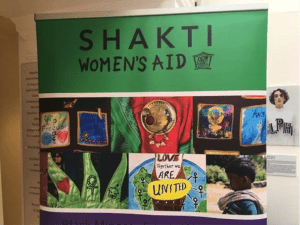 Shakti’s main aim is to end Gender Based Violence towards Black Minority Ethnic (BME) women and their children (if any) fleeing from Domestic Abuse, Forced Marriage and so called Honour Based Violence and ensure they receive appropriate and non-discriminatory support services. Due to the immigration rules Women with no recourse to public funds do not have the same rights as women who have indefinite to leave or is a British citizen. Consequently, these women may have to live in abusive relationships putting themselves and their children (if any) at risk of domestic abuse. One of our biggest and most distressing challenges in recent years has been the marked increase in contact from women who, due to discriminative immigration rules, have ‘No Recourse to Public Funds’ (NRPF), meaning they have no access to social housing, benefits and some of them have no right to work in the UK. Women’s’ options are to return to their abusive partner or live on the streets, forcing them and their children into a very dangerous and unpredictable life. We want to eradicate gender based violence and believe this must include all women, regardless of their immigration status. We believe that preventing these women from accessing services is a breach of their basic human right to be safe and live a life free from violence and fear. In June 2016 three of our staff members completed a sponsored walk, raised around £1500 for these women. 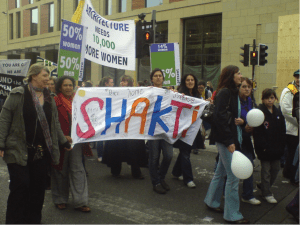 In Scotland, for the past 20 years, Shakti has been at the forefront of campaigning and raising awareness about the problems faced BME women and their children who have No Recourse to Public Funds (NRPF) and are subjected to domestic abuse. Shakti is a member of the National No Recourse to Public Funds Campaign Group and has been actively involved in the Campaign to Abolish No Recourse to Public Funds. The Campaign Group have been successful in the Home Office introducing Concession for Destitute Victims of Domestic Violence (concession allowing victims of domestic violence on spousal visas with no recourse to public funds (NRPF’s) to access benefits and public housing while they apply for settlement under the ‘domestic violence rule’). The campaign is on-going. In 2016 Shakti organised a conference on this issue ‘Disparity in Britain. Changing Europe: the real experiences of women subjected to domestic abuse’. Like and follow us on Facebook and Twitter (see section below). Support Shakti to support women, their children and young people with ‘no recourse to public funds’ status by purchasing a copy of our fundraising book ‘Real Women: Unheard Stories’, for £10.99 per copy plus postage and packaging. The funds raised from the book selling goes towards financial support to women with NRPF.